Corsair's burgeoning range of PC enclosures includes something for just about every type of user, but for the ultra-enthusiast, you could argue that the last few years have been barren. The original Obsidian Series 800D laid down a marker way back in 2009, and though the subsequent 900D expanded the bigger-is-better approach in 2013, there's been nothing new to shout about for quite some time. 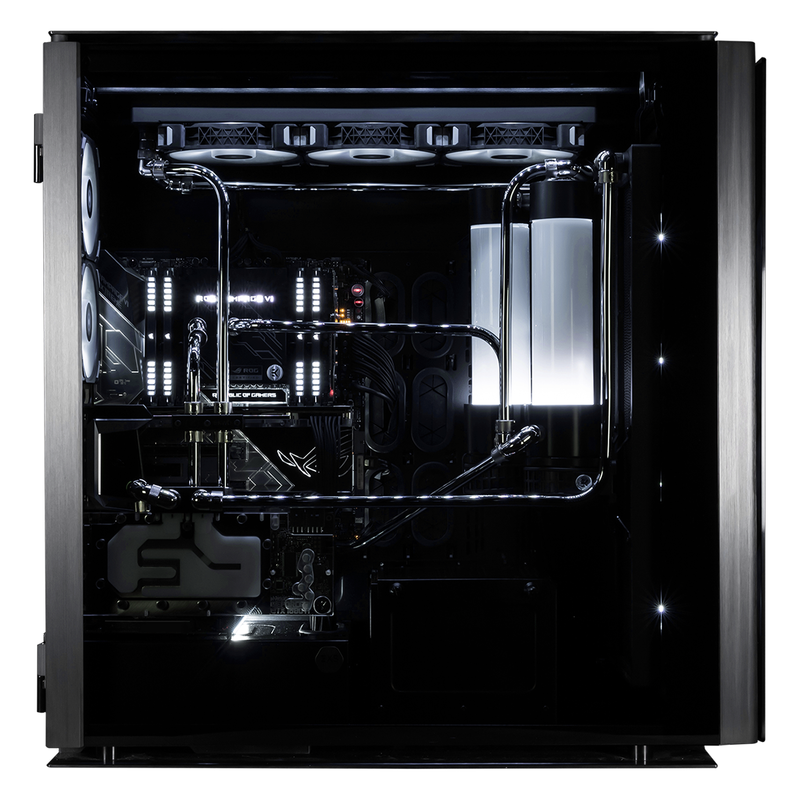 The good news for those who favour an over-the-top build is that the wait ends today with the launch of the Obsidian Series 1000D. Price tag? A mere £450. Dimensions? A whopping 693mm x 307mm x 697mm. Weight? A back-breaking 30kg. It's called the 3XS Carbon Fluid Extreme Xp SLI and with a price tag of £13,999, it's worth more than my car, and truth be told, probably more powerful. 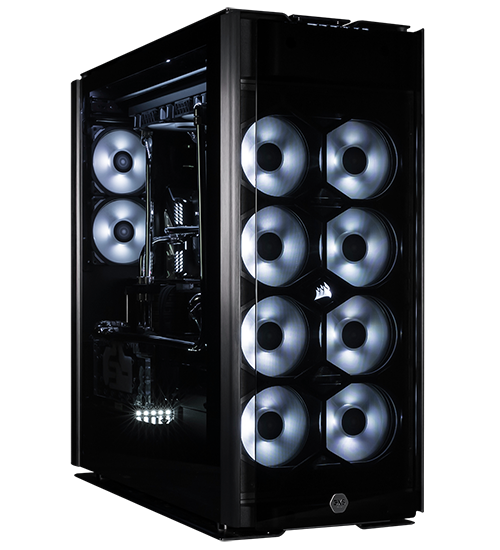 A massive chunk of change, but pick your jaw up off the floor; Scan tells us this is a typical ballpark for extreme enthusiasts with particularly deep pockets, and though few could justify such an expense, the fact that you're getting two PCs in one helps soften the blow. Why two PCs? Good question. Corsair obviously wanted to go one better than the already-gargantuan 900D, and so what's the next logical step? 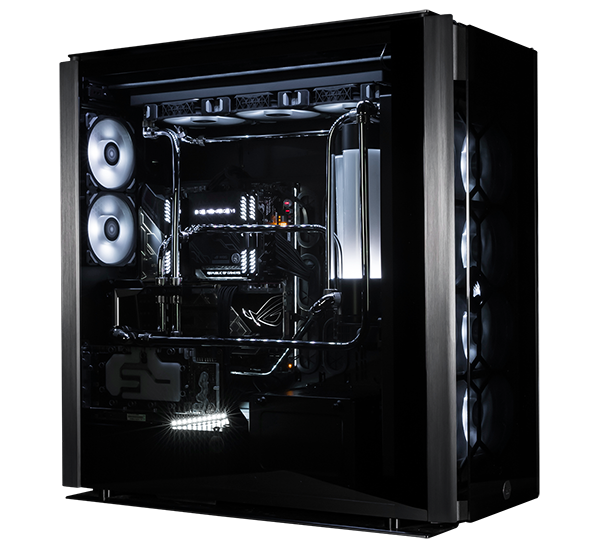 Yep, you guessed it, Obsidian Series 1000D has enough room to house two complete builds inside the one case. Who actually wants two systems in the same chassis? That's another good question. 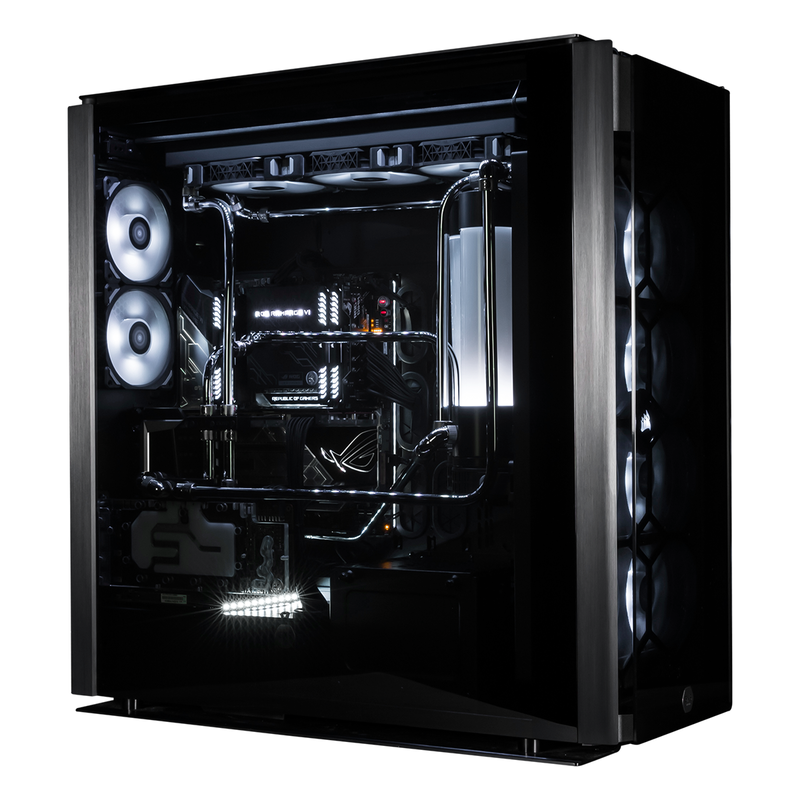 Corsair reckons the secondary system could be dedicated to streaming, or serve as a file server, but we're yet to be convinced and eager to hear your thoughts - can you anticipate any scenario where you'd want to build two rigs into one case? Still, if you want to go insane on your next build, the 1000D is an obvious starting point. 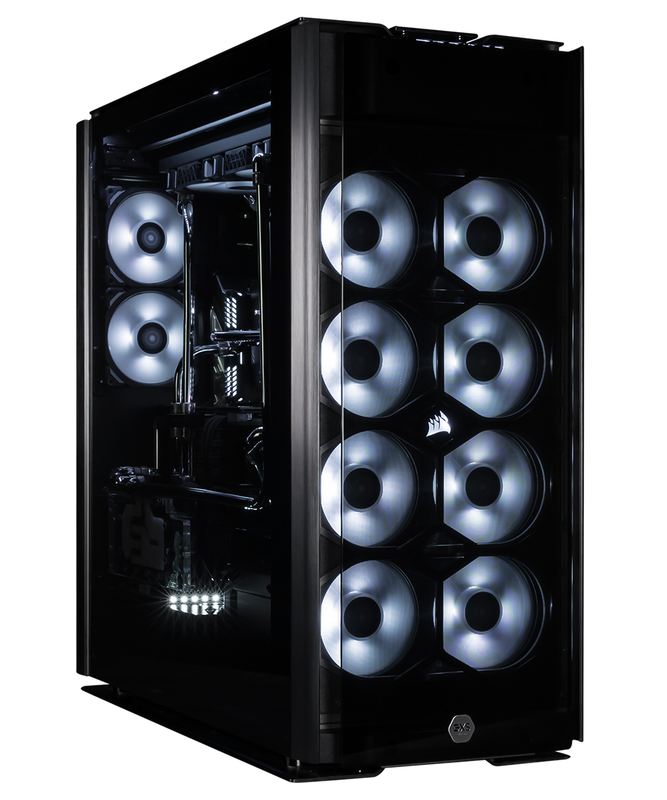 Corsair reckons this is the most feature-rich case it has ever built, and also the best-looking Obsidian Series case yet. 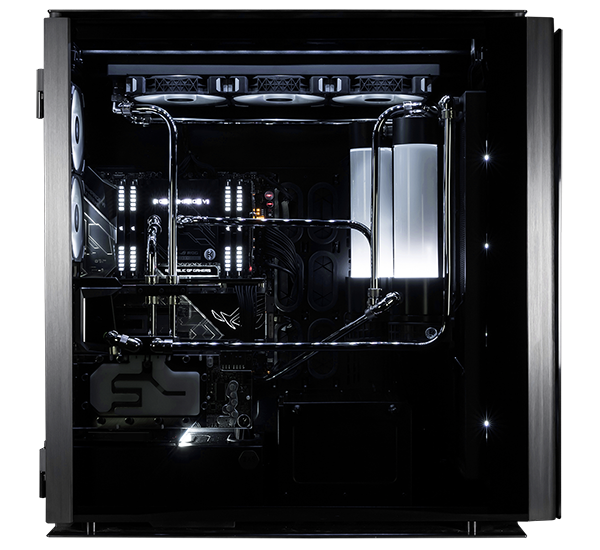 Smoked and hinged tempered glass side panels provide quick access and streamlined aesthetics, while the floating glass front panel adds much-needed softness to an otherwise hulking form factor, and as you'd expect, there are plenty of provisions for RGB lighting. Corsair includes a Commander Pro lighting and fan controller, meaning temperature, speed and illumination can all be monitored and tweaked via the Corsair Link app, though do be aware there aren't any fans included as standard. Corsair's reasoning is that enthusiasts tend to want to use fans of their choice, and you won't be left wanting when it comes to mounting points. 1000D can accommodate up to 18 fans, with the ability to mount a quartet of 480mm radiators simultaneously, there are dedicated pump/reservoir mounting holes, and tool-free telescopic trays should make radiator installation a breeze. The ability to house E-ATX and Mini-ITX motherboards as well as ATX and SFX power supplies at the same time is of course the major talking point, but even if you use the chassis for a single PC, it has plenty of the mod-cons you'd come to expect. The primary PCIe slots are rotatable for vertical GPU mounting, there are half-a-dozen 2.5in SSD mounts fitted to a French-door-style rear storage compartment, a separate cage offers five 3.5in storage bays, and the I/O ports have been brought up to date. Lining the top-front edge and sandwiched between the usual power and reset buttons and audio jacks, is a neat arrangement of four USB 3.0 ports and two USB 3.1 Gen 2 Type-C. These are of course outfitted with configurable RGB backlighting, but there is one unexpected quirk; there's only one power button. As it turns out, the secondary Mini-ITX build, should you choose to use one, is controlled via separate power and reset buttons located on the back of the case. We've no idea why Corsair decided to put the on button out of reach, and on a case of this size, it is a considerable reach. Our initial impressions? The sensible part of us can't ignore the fact that two chassis would be cheaper and easier to manage, but though the Obsidian Series 1000D isn't for the average user, we are admittedly intrigued to see what enthusiasts and modders can cook up. With that in mind, let's see what Scan has done with that cavernous interior.